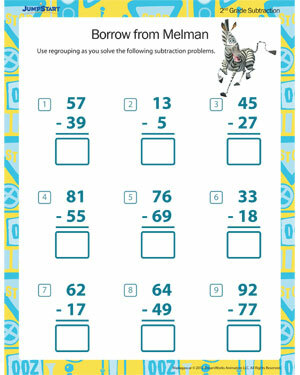 Wondering how to solve these subtraction problems correctly? Have no fear, says Melman. With him there to help you, solving these second grade subtraction problems will prove to be a cakewalk for you. Use the regrouping method to help you cruise through this free printable subtraction worksheet with ease. You can thank Melman once you have a pro at these second grade math problems. Get cracking now! Also check out other such fun MAD worksheets here!